Over the last five months, the pure FPGA market data vendor added 10 markets in five continents, marking an important milestone. NEW YORK, LONDON, PARIS – DEC. 13, 2016 – NovaSparks™, the leading field programmable gate array (FPGA) market data company, today announced that it has significantly expanded the market data coverage of NovaTick, its flagship ticker plant product. The Company added 10 markets across Japan, Australia, Hong Kong, Northern Europe and Canada in the last five months. 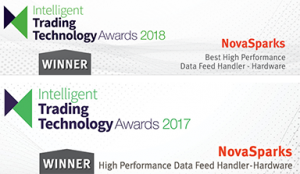 The rapid expansion of NovaTick’s feed coverage further ensures that banks and trading firms do not have to compromise coverage for performance. Compared to traditional software solutions, NovaTick is five to 10 times faster on average, and 50 to 100 times faster during traffic peaks. NovaTick’s design is based on a pure FPGA architecture where all real-time market data processing functions are performed in hardware resulting in the lowest and most deterministic latency. This FPGA-centric architecture is augmented with tightly integrated Intel processors to support non-latency sensitive tasks such as exchange recovery functions. NovaSparks’ ticker plants have a common output format across markets. They are consumed with a single application programming interface (API), which allows banks and trading firms to deploy additional feed-handlers quickly and effortlessly.